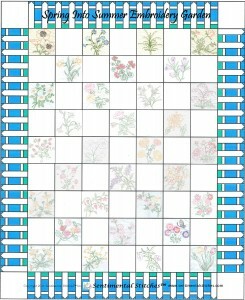 I just found this beautiful Spring Into Summer Free block of the month quilt at Sentimental Stitches. For download of her patterns click here. The block designs are downloadable in PDF format and are just gorgeous. This is currently in progress and has maybe four more blocks to be posted. Thank you SO much Sentimental Stitches. Go on over there and check out many more free patterns too. This will permanently be added as a link in the Free Pattern Tab above.